The two beach houses that former Virginia Gov. Bob McDonnell owned with his sister lost as much as $60,000 a year, McDonnell's former brother-in-law testified Monday at the federal corruption trial of McDonnell and his wife, Maureen. 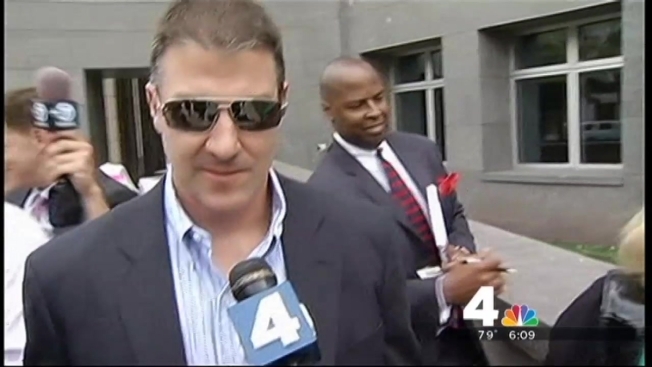 Michael Uncapher used to be married to Bob McDonnell's sister; the couple divorced last year. And Uncapher says he kept up with the finances for the beach properties -- including being on the phone twice with Bob McDonnell's wife, Maureen, and ex-CEO Jonnie Williams as the two talked about the beach houses. In 2012, Williams wrote two checks to help with the red ink, one for $50,000 and one for $20,000. Those checks are part of the case that prosecutors are trying to make against the McDonnells; they claim that the couple took more than $165,000 in gifts and loans in return for the former governor's support of Williams' company, Star Scientific, and its supplement Anatabloc. But defense attorneys tried to counter the portrayal that the McDonnells turned to Williams because they were desperate for money. Uncapher testified his wife -- who was a partner with Bob McDonnell in a real estate company called MoBo -- made a half million dollars that year. In other testimony, two top McDonnell administration officials recalled a March 2012 meeting that ended with Bob McDonnell pulling a bottle of Anatabloc out of his pocket and telling the group it had helped him. But Sara Wilson, the director of the Virginia Department of Human Resources Management, remembered the incident slightly differently. "I had no idea why he pulled it out," Wilson said. "There was no ask. it was personal." Earlier Monday, the onetime chief of staff to the former governor said he had no idea at the time that his boss had received thousands of dollars in gifts and loans from Williams. Martin Kent testified that Star Scientific wasn't on his radar until just before a planned lunch at the governor's mansion in August 2011. He was alerted because Star Scientific was poised to issue a press release about the launch of Anatabloc -- and the release appeared to say it would happen at the mansion with the McDonnells' blessing. Kent and other staffers made sure the company revised the news release. After that, it wasn't until news broke of the investigation into the gift scandal that he learned about Williams and Star Scientific. UpdatedMcDonnell Staffer Heard of "Piles of Gifts"
Prosecutors asked Kent about the governor's reaction after investigators first met with Maureen McDonnell in February 2013. "He was upset," Kent said. "He said the interview was not what it was purported to be. He was visibly upset." Kent said that after news of the investigation broke in the media a few months later, he tried to ask McDonnell about the loans from Williams, but the governor wouldn't provide any information. "I went to his office and asked generally about the loan, and he said it was a matter he was discussing with his counsel," Kent said. Defense attorney Henry Asbill later countered by asking, "Did you ever hear my client ask for something to be done for Jonnie Williams or Star Scientific?" There was also more testimony about the mansion lunch for Star Scientific in August 2011, the day the company launched a supplement called Anatabloc. Kent testified about how there were three natural disasters the office was dealing with at the time: Hurricane Irene, the aftermath of a 5.8-magnitude earthquake, and a fire in the Great Dismal Swamp. Prosecutors made the point that the governor still managed to get to the luncheon. Nearly two dozen more photos were introduced into evidence Monday, showing Bob McDonnell behind the wheel of a Ferrari, driving home from Williams' lake home. Kent said after that drive, the executive protection unit complained because they couldn't properly protect the governor. Kent says he told Bob McDonnell that his decision to drive himself had hurt morale. "It had hurt morale; their primary job is to protect and they can't protect him if they are driving behind him," Kent said. Paul Perito, who served as Star Scientific's board chairman when Williams was CEO, said Williams was "on cloud nine" after the August 2011 luncheon at the governor's mansion on the day Star Scientific launched Anatabloc.